Mara Goldberg, CAS/BA '13 and Matt Shlonsky, SIS/BA '14 enjoying the views from The Kennedy Center before seeing the Book of Mormon. Photo courtesy of Ben Matek, CAS/BS '12. I am tremendously saddened to inform you of the death of School of International Service 2014 alumnus Matthew Shlonsky. Matt was shot near the Shaw-Howard University Metro station in Washington, DC, just before 5:00 p.m. on Saturday, and taken to a hospital where he later died. I am at once at a loss for words yet also resolute that he not merely be remembered by his death, but how he lived. Matt came to American University from a suburb of Cleveland, Ohio, and was a proud Clevelander. After his graduation, he joined Deloitte Consulting as a Business Analyst, consulting on strategic communications, organizational transformation, and business development. He also worked as a tutor for LS Tutors, where he hoped to train students to develop strong organizational skills. He had served as a Hebrew tutor and homework aide at the Washington Hebrew Congregation while studying at the School of International Service, and he worked throughout his high school years at the Temple Tifereth-Israel in a Cleveland suburb. A colleague at the Washington Hebrew Congregation recalls, "warm with a spectacular attitude, Matt was adored by all of the students in our school." While studying at the School of International Service, Matt interned in the office of Ohio Senator Rob Portman, as well as the government affairs office of Amgen, and the Glover Park Group. Senator Portman said in a statement, "Matt was a talented young man with a bright future who was taken from us too soon. He was an outstanding intern for me in Washington." Matt was a passionate hockey player and skier, and served as captain of his high school hockey team. At American University, he was active in the Men's Club Ice Hockey, Pi Kappa Phi fraternity, AWOL Magazine, and the Kennedy Political Union. He also studied abroad at Universidad Diego Portales in Chile. He cared deeply about Latin America, and earned a Bachelor of Arts in International Studies with a concentration in International Business Relations and a regional concentration on Latin America. Matt also loved the Washington music scene and worked as a writer and in business development at The Mues, a music and artist promotion company here in Washington. Now that I have told you a little about what he did, please let me tell you about who Matt was. Matt was smart, enthusiastic, motivated, conscientious, easy going, and a willing volunteer who helped anyone who sought his assistance. I met with Matt when he last visited the School of International Service two weeks ago to serve on an alumni panel for our pre-college program, and his enthusiasm for what he was doing was infectious. While a student at the School of International Service, he volunteered his time to help faculty with their research--and his work was excellent, thanks in large part to his sharp intellect, strong work ethic, and tremendous passion for learning. Faculty, staff, fellow classmates, and others greatly enjoyed working and being with him. While he had very well informed views for a person his age, he was also open to new ideas and always interested in others' points of view. I share the grief of Matt's profound loss with the countless School of International Service faculty, alumni, staff, and students who knew him during his time as a student and subsequently as an alumnus. I will update you with information about a memorial or service for Matt as I learn more. Students, faculty, staff, and alumni are encouraged to seek counseling support if they would find it helpful during this difficult time. Counseling resources for students are available through the Counseling Center at http://www.american.edu/ocl/counseling/ (outside of business hours, please contact AU Public Safety and request the counselor on call). Counseling resources for faculty and staff are available through Human Resources and the Faculty/Staff Assistance Program at http://www.american.edu/hr/FSAP.cfm. Chaplain resources for all members of the American University Community are available through the Kay Spiritual Life Center at http://www.american.edu/ocl/kay/index.cfm. In moments of jubilance and in moments of tremendous sadness, I am reminded that the School of International Service community is a family. As a family, I ask that we embrace those suffering from Matt's senseless and tragic loss, and that we continue to support one another in the weeks and months ahead. Read the dean’s announcement of the School of International Service Matthew C. Shlonsky Memorial Fund for the District of Columbia. 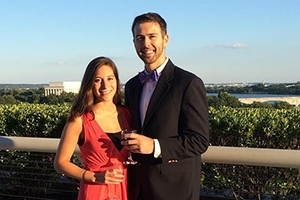 Contribute to the School of International Service Matthew C. Shlonsky Memorial Fund for the District of Columbia.